The BMW 2 Series Coupe is a significant departure from the old 1 Series Coupe - not only by its looks, but in the way it drives too. In recent years, smaller, more affordable cars have become the craze in the entry-level luxury vehicle class. Being the smallest coupe in the Bavarian lineup, the all new BMW 2 Series embodies that very 'less is more' trend. 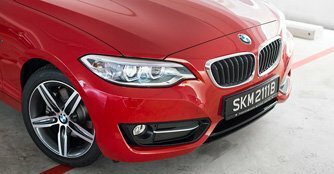 The 2 Series will continue BMW's run with compact coupes but with a new numeric designation to be in line with the rest of the company's two-door models. So just like how the 4 Series served as a replacement for the 3 Series Coupe, the 1 Series Coupe will be replaced by the 2 Series. The new 2 Series carries on the classic three-box design with a long bonnet, short overhangs and a set-back passenger cabin. But the 2 Series is bigger than its predecessor. Measuring 4,432mm x 1,774mm x 1,418mm (L x W x H), the new car is 72mm longer, 26mm wider and 5mm lower than the outgoing 1 Series Coupe. 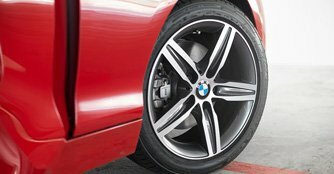 Borrowing the 4 Series' styling recipe, the 2 Series receives a lower roofline, a wider stance and a longer wheelbase, adding up to a noticeably more handsome car. The sporty looks start upfront with pointed LED headlights emphasising the signature kidney grille and continues across the bonnet with four contour lines streaming through it. The side profile delivers a classic coupe look while the sloping roof looks the business. The view from the back end is equally impressive, especially with the classic BMW L-shaped lights that stretch all the way out to the boot edge, enhancing the wide low stance that creates a powerful-looking image from the rear. The 2 Series comes across every bit as sporty as it can get but yet it maintains a good balance of being subtle and refined at the same time.